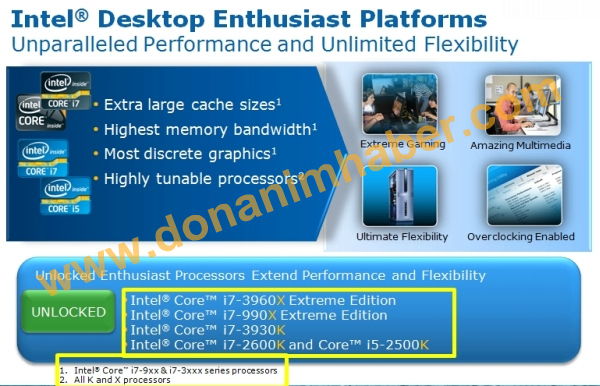 New Intel Slide presentations have been leaked which detail the upcoming Sandy Bridge-E Processors. 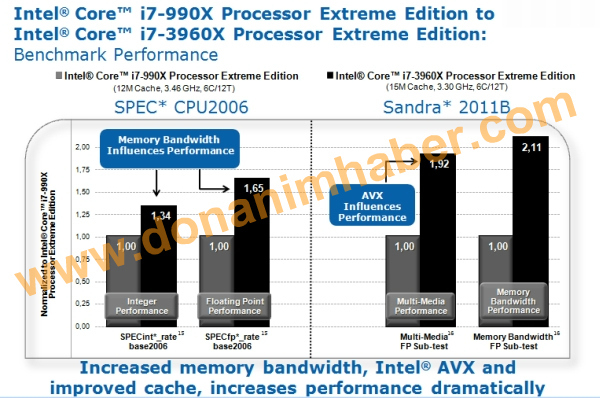 The slides have detailed the performance estimates of Sandy Bridge-E top offering “Core i7-3960X Extreme Edition” against the LGA1366 top CPU ” Core i7-990X Extreme Edition”. We previously detailed here the clock speeds of i7-3960X which features Six Cores/12 Threads, a base clock of 3.30Ghz which can Turbo upto 3.90Ghz, 15MB L3 Cache and Hyper Threading. Both CPU’s were pitted against each other through a series of benchmarks which include Cinebench 11.5, POV-Ray 3.7, 3DMark 11 physics, Pro-Show Gold 4.5, SPECint_rate base2006, SPECfp_rate base2006, ans SiSoft SANDRA 2011B multimedia and memory bandwidth. 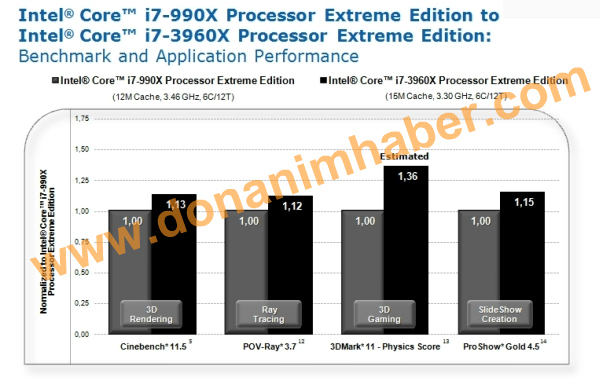 The chart shows that the Core i7 3960 was about 40-50% faster on average than the 990X. Memory Bandwidth is also noticeably higher due to Quad Channel DDR3 interface while the new AVX instruction set and hyper threading helped alot in gaining a better score for media encoding.